Do your gums ever bleed when brushing or flossing? According to research conducted by the U.S. National Institutes of Health (NIH), over half of Americans over 30 had bleeding gums. While some may believe this is normal due to sensitive tissues in the mouth, bleeding gums can actually be a sign of gum disease and should be addressed immediately. If left untreated, gum disease could lead to you losing your teeth! Here is everything you need to know from a dentist in Long Island City about gum disease and how to keep your gums and teeth healthy. Periodontal disease, more commonly known as gum disease, is an infection that of the tissues that hold the teeth in place. Most common among adults, gum disease is caused by the bacteria in plaque, which can build up on teeth and harden if not removed through daily brushing and flossing. If gum disease is allowed to progress to advanced stages, it can lead to swollen, bleeding gums, painful chewing problems, and even tooth loss. Stage 1: Gingivitis – Gum inflammation is caused by toxins produced by plaque buildup at the gumline. Gums may bleed during daily brushing and flossing. Damage can still be reversed at this early stage. Stage 2: Periodontitis – The bones and fibers that hold teeth in place are irreversibly damaged. Pockets may form below the gumline that trap food and plaque. Further damage may be prevented with proper dental treatment and improved home care. Stage 3: Advanced Periodontitis – The final stage of gum disease. Teeth may shift or loosen because the fibers and bone supporting them have been destroyed, leading to bite problems. Teeth may need to be removed. Quit smoking – Smoking tobacco is a major cause of severe gum disease. Practice Good Oral Hygiene – When done correctly, daily brushing and flossing can help remove most of the plaque from teeth and prevent gum disease from developing. Visit Your Dentist Regularly – Only a professional cleaning from your dentist or dental hygienist can remove plaque that has hardened into tartar and can contribute to gum disease. Following these simple tips can help prevent gum disease from developing in your mouth. 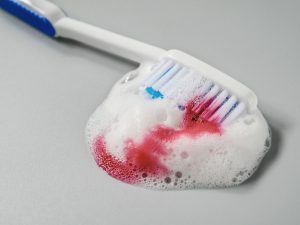 Moreover, if your gums begin bleeding while you brush, do not hesitate to contact a dentist in Long Island City. An active member of both the American Dental and NY State Dental Associations, Dr. Ishwinder Saran has a long track record of establishing trusted patient-doctor relationships and providing high-quality dentistry. His many areas of expertise include periodontal therapy, meaning he can help patients prevent or treat gum disease. Dr. Saran can be contacted via the LIC Dental Associates website or by calling the office at 718-530-6539.